Watching the St. Patrick’s Day parade today I’ve been inspired by everything green and after getting out of the cold and snow on Fifth Avenue, my fingers have finally thawed out enough to type! Ireland owes its moniker the Emerald Isle, to its bucolic green countryside, not because it’s a prolific source of emeralds. 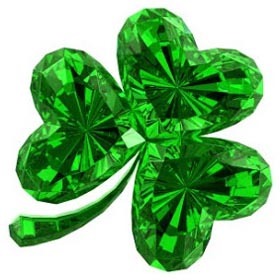 Either way, emerald jewelry is often associated with Ireland and Saint Patrick’s Day. Emeralds, the traditional birthstone for May, are mined in a number of locations in the world (none of them being Ireland), the most beautiful often from Columbia, but are also found in South America and Africa among other places. One of the most famous Columbian mines is the Muzo mine, near Bogota which produces rich, dark emeralds in green to bluish green shades. Emeralds are part of the Beryl family of gemstones, which also includes the very popular blue to greenish blue aquamarine and pink to peachy pink morganite. Since color is more of a consideration than clarity when choosing a colored gem, rather than a diamond where the opposite is true, there is a certain amount of inclusions (or flaws) that are generally accepted and expected in emeralds. Inclusions in emeralds are often referred to as “jardin”, which is the French word for garden, due to their wispy appearance. Even though emeralds are a relatively hard stone (7.5 – 8 on the Mohs scale) the inclusions can affect their durability. The gorgeous green stones are also more prone to scratching and are generally not a great choice to wear everyday.